Today I experimented with a free online tool called Poll Everywhere that allows students to participate in a poll that yields real-time data. What is the big deal, you ask? 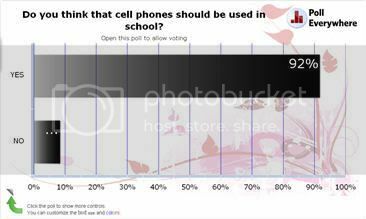 The big deal here is that students vote by using their cellphones. They send in a text message to the appropriate number as given on the poll that you design. If you have the graph projected for the class to see, they can watch the graph update immediately as votes are cast. There is no need to even refresh the screen. The above picture is a screenshot of a quick field test that I did with a small class of students. It was fun to watch them willingly pull their phones from hiding and text their votes. (FYI, we threw 'NO' vote in there just to mix things up and watch the graph update. The students were all for it.) The idea was really to try and get some first impressions from the students on engaging in this type of activity in the classroom. The response was a positive one. I also like the idea that a teacher can get a sense of how well the students are grasping the material with a tool like this. Imagine asking the students a test type multiple choice question via the poll - All students can respond anonymously - giving the teacher a very fast sense of where students are as a group. Sure, Q&A sessions can still be done via the 'raise your hand and wait until I call on you' method but you often get the same group of kids that will raise their hand and speak up. Students do not want to be embarrassed if they do not know the answer. This way allows the teacher to see where the whole class is very quickly by getting feedback from everyone on the same question with no hard feelings. It is interesting to note that when I asked the students in the class what type of texting plan they had - 100% said they had the unlimited plan. A teacher can sign up for the free plan which will allow them to create as many polls as they want which can be responded to by up to 32 people. That would cover most classrooms. Does anyone have any stories to share about using this tool in their classroom? I would be interested to hear what types of uses you have come up with for the tool.